This may be just one track, but what a track! part Ramones fuzz, part loud surf trash, and all energy! Yee-haw! 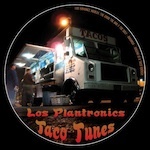 On the throbbing side, Los Plantronics medley a bunch of classics with youthful exuberance and jaws harp. This is entirely cool, with fire in its bones and reverb in its amps. Throbbing tremolo and big rumble! Way too cool!